Get instant access to all your media in your bedroom. The Mini is a perfect companion for the HDShuttle. This system connects to the HDShuttle Server to playback simultaneous content in another zone from the same library. This system connects to the HDShuttle Server to playback simultaneous content in another zone from the same library. HDShuttle is a powerful media player that automatically builds your library by fetching metadata on your content using IMDB. 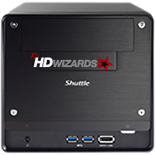 What is the HDshuttle Media Server ? 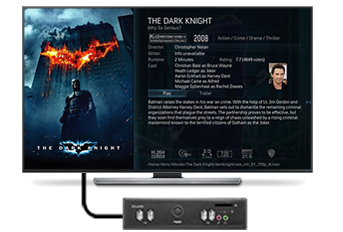 The HDShuttle is exclusive, infused with the simplest technology out there to date such as XBMC / KODI and PLEX customized with the Middle East region in mind. 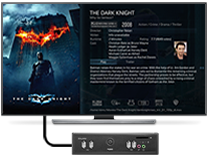 A multimedia player and storage that mixes all of your content like Movies, TV Shows, Music & footage from USB hard Drives, Internal Storage and Network Storage Drives (NAS) in one multimedia player perfectly suited for your home cinema. HDShuttle can build your Movie Library by detecting film Names in a very folder then mechanically fetching all the infromation from the net automatically in one single click, an equivalent goes for your TV Shows,Music & photos. 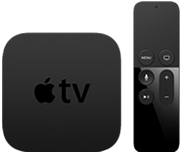 Play/pause your Movies and TV shows, control your media library and create playlists. Almost all functions XBMC / KODI provides, you can run from HDwizards Manager. Fully integrated to download your TV shows automatically, you can now do it all from within HDwizards Manager. All features like: add new show, search episode, next up and show overview can be handled through this interface. Seamless automatic downloading from usenet and torrents. It is fully automated so you dont have to look at it. And now with HDwizards Manager, all its great features are easily manageable and combined with all the other features.